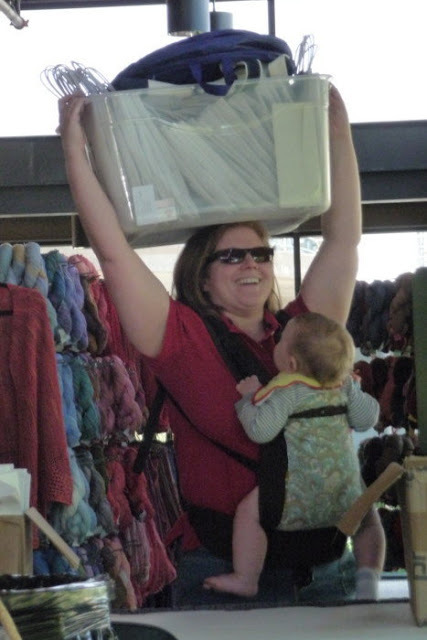 I asked the President of the DFW Fiber Fest, Anna Hulse, to answer a few questions about herself and about the festival for those of us who have just gotten acquainted with it in the past couple of years. Anna is a long-time crocheter and a new mom, who finds time to get this really big festival pulled off somehow. This festival is the largest, closest fiber festival in the Dallas/Fort Worth metroplex, bringing knitting, crochet, and spinning teachers and vendors (national and local) right to our door. JRF: How did you get interested in crochet? Anna: I've always been a crafty person. Ever since I can remember, mom and I were always making something, mostly cross-stitch. However, during my senior year of high school, the mother of one of my bowling teammates always brought crochet to work on during our games. She churned out afghans at an amazing rate. I was fascinated, but for whatever reason, never asked her to teach me. Then I went to college - Wesleyan College in Macon, GA, a women's college with a big sister/little sister class system. My big sister, Dawn, crocheted, and I asked her to teach me. I've been hooked ever since! JRF: How has yarn and fiber added to your life? Anna: What an interesting question. For starters, it's a HUGE part of my life. If I'm not thinking about DFW Fiber Fest, I'm thinking about the next project, or the next yarn, or when I want to seriously take up spinning (I learned last year) or heaven help me, weaving. I discovered Crochetville.org while I was living in Germany and that gave me a community of people I could meet and connect with while living in a foreign land. Joining that board helped keep me sane and grounded during my adventures in Germany. It also took my hobby from a side thing I did to something that I WAS. Instead of crocheting occasionally, I became a crocheter (TM). When I moved back to the States, it also gave me a community to belong to while I was still fitting myself back into this culture. Crocheting grounds me, calms me. JRF: Who are your fiber heroes? Anna: I love these questions! I had to think about this one for awhile. My current fiber heroes are the original board members of DFW Fiber Fest, in particular Margo Lynn. They had the initiative and drive to answer their question of why isn't there are fiber festival that brings nationally known teachers to our region? It took an incredible amount of passion and time and energy to get it off the ground. I wouldn't be as active in the local fiber community without Knit Out Crochet (which they also helped sponsor) and then DFW Fiber Fest. JRF: DFWFF is in Grapevine this year instead of Addison. Can you give us a little of the history of DFWFF and its goals for the future? 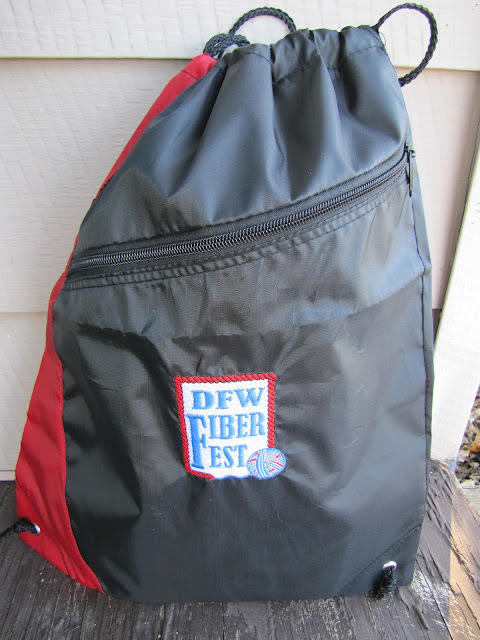 Anna: DFW Fiber Fest was founded as a non-profit organization in 2005 and we had our first event in Addison, TX in 2006. We grew from a handful of vendors and teachers that first year to bursting at the seams in 2010. The DFW Metroplex, and Texas by extension, has a large fiber crafting community, and not all of us can go attend the 'big' events around the country, so we are trying to serve those crafters by bringing the talent here. We have a strong LOCAL ethic and try to provide a great variety of local/regional fiber vendors (with a few who are from outside of our regional area to spice up the mix). Educationally, our goal is to create an annual theme that encompasses many areas of fiber craft - knitting, crochet, spinning and related crafts such as weaving and dyeing. We then work to bring in an interesting selection of nationally known designers/instructors who are able to flesh out our theme as well as being lucky enough to be able to draw from the wealth of knowledge offered by our local/regional teachers in each of our subject areas. For our 2011 event, we are moving to the Grapevine Convention Center in Grapevine, TX. This serves two purposes - it increases our vendor hall space and allows us to be more centrally located in the Metroplex. Looking forward, we will remain at the Grapevine Convention Center for the 2012 event (March 30-April 1, 2012). We hope to expand our national teacher coverage and bring in a nationally known spinning teacher (and would happily receive suggestions to help us achieve that goal!). After that - we'll see. At heart, we are a smaller festival. But interest in our small festival is growing, and we anxiously anticipate the need to move to a larger space for 2013. The 2011 DFW Fiber Fest will rock the Grapevine Convention Center from April 8-10. And even though my two classes are sold out, there are spots still available in several way-cool classes. So SWEET to meet you, Anna ! Thank you so much for all the energy you've put into making this the great fiber fest of DFW !!! Love the interview. Anna does such a great job. It's going to be a fun year! Great interview! Thanks, Cindy and Anna, for sharing!